Munich has carved out a place for itself among the world’s top foodie destinations, and our local tips for the best fine dining restaurants will help you enjoy them for yourself. From historic, classic delights, perfected over the years, to the most delectable up-and-comers, we’ve compiled a short list of some of our favourite restaurants in Munich that are guaranteed to whet and sate any appetite. Family-owned since its creation in 1901, Boettner’s unbeatable restaurant now occupies a grand location on the Pfisterstrasse, in Munich’s stunning old city. Lustrous woods and rich design create an ambience of elegance, while the menu surprises with ever-changing flavours which reflect the season and the whim of the renowned chef. Set apart from other classic restaurants in Munich by its inventive tastes, at Boettner’s you’ll find the ideal balance of new and old, modernity and tradition. Discover an award-wining take on traditional Bavarian dishes at the Königshof Restaurant, in the eponymous luxury hotel. Here, you will find a cosy, comfortable setting with an elegance that is all in the details. In the design, delicate gold detailing and original artwork give a sense of royal luxury, while the details of the menu is in the preparation. Refining classic dishes to near perfection, Chef Martin Fauster prides himself on making every meal a true delight in every sense of the word. 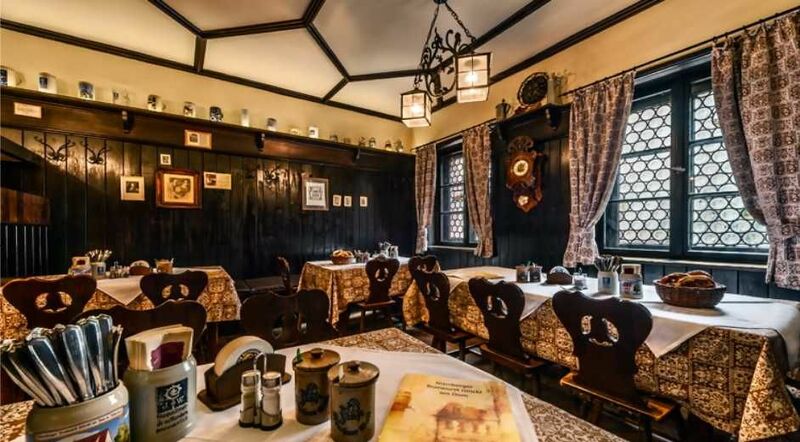 Travel back in time right in the heart of Munich at Bratwurst Glöckl. Here, every element hearkens back to a time when everything was done by hand and there was unmistakable heart. Set in a building older than the neighbouring Cathedral and serving dishes made from century-old recipes, this is easily the truest taste of historical Munich. But by no means does that mean that the dishes aren’t exquisite. Meats from their own butcher, beer from the local brewery, everything painstakingly prepared to bring you the finest Bavarian flavours in Munich. One part café, one part deli, one part Michelin-starred restaurant? Yes, that’s right. Dallmayr is one of Munich’s most whimsical and original eateries, serving everything from take-home meats and cheeses to delicious coffee to award-wining meals. A wonderfully understated setting makes for a light, refreshing feel, while the cuisine matches the atmosphere perfectly with stunningly presented and wondrously flavourful dishes. Das mit 15 Gault Millau Punkten ausgezeichnete Restaurant, welches zum berühmten „Bayersicher Hof Hotel“ gehört, serviert bewährte Klassiker, die von Innovativen Ansätzen beeinflusst sind. Vor allem im Sommer, wenn die Sonnenterrasse geöffnet ist, ist das Garden Restaurant absolut empfehlenswert und man sollte immer vorab reservieren!